distances up to 1000m. Includes batteries, mounting hardware, and remote cable pressure pad switch. The DBAL-D2 brings all of the capability of our DBAL-A2 which the addition of our technologically advanced IR LED illuminator (patent pending). The integration of this powerful, eye-safe toll sets the D2 apart from any other tactical device of its kind. Manufactured with high definition, aspherical telescopic lens technology, the DBAL-D2 features a 2 to 30 adjustable illumination beam. 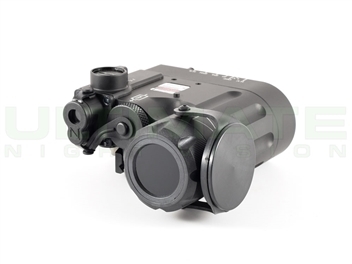 This highly collimated beam significantly enhances night vision performance and offers an eye-safe manes of illuminating distances up to 1000m. The military/LE DBAL-D2 model also features an enhanced end cap, taking full advantage of the added switching capabilities of the full powered D2. Available in Black & Desert Sand. Thanks for the quick response and excellent product. The laser works flawlessly.